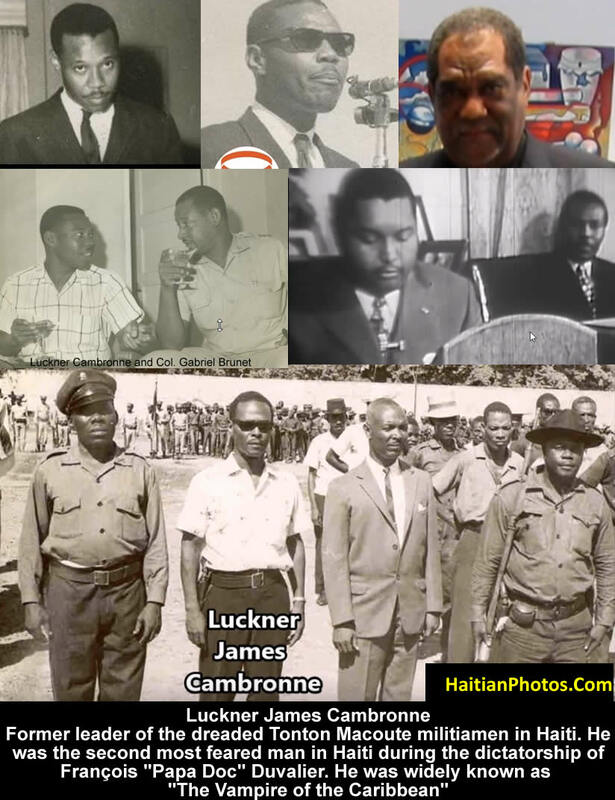 Luckner James Cambronne, born Arcahaie, Haiti 1929, former leader of the dreaded Tonton Macoute militiamen. He was the second most feared man in Haiti during the dictatorship of François "Papa Doc" Duvalier. Luckner James Cambronne was widely known as "The Vampire of the Caribbean" for his business of transporting Haitian blood and cadavers to US Hospitals, Medical schools and other foreign hospitals for huge profit. Luckner Cambronne (30 October 1930 - 24 September 2006) was a high profile Haitian politician who rose to the number two position in power during François Duvalier's regime in Haiti. Luckner, the son of a poor preacher had a career as a bank teller, but his alliance with François Duvalier brought him to the powerful political arena where he started out his political career as a messenger for Duvalier, and to finally become second in command and head of his fearsome private militia popularly known as the Tonton Macoutes throughout the 1960's and the beginning of the 1970's. Duvalier created the militia because he felt threatened by the Haitian army. During their reign of terror, the group slaughtered more than 600,000 Haitians. Luckner's unique brand of cruelty enabled him to become very rich and earned him the nickname "Vampire of the Caribbean." He was named 'Vampire' because of his lucrative practice of selling corpses and blood of Haitians to US and other foreign hospitals at a huge profit. His brutality was incomparable. Luckner never hesitated to kill innocent people for the growth of his business. He used to buy Haitian cadavers from the General Hospital in the capital, Port-au-Prince, for 15 gourdes ($3) a piece to sell them to American medical schools. This made many unfortunate mourners to find their loved one's coffins mysteriously empty. In some cases, it was found that the exported bodies were still alive and they were shipped for high value, resulting in huge profits. Tonton Macoutes" had a cruel practice of frequent random executions; they often stoned and burned people alive. After the death of François Duvalier in 1971, Cambronne was said to oppose Papa Doc's nomination of his 19-year-old son Jean-Claude Duvalier as successor, but Jean-Claude's mother, Simone Duvalier, outmaneuvered Cambronne and insisted on his exile. Lastly, Cambronne moved to Miami, Florida, in 1972 where he died on 24 September 2006. Here is a picture of the Duty Free Americas (DFA) store located at Toussaint Louverture International Airport. 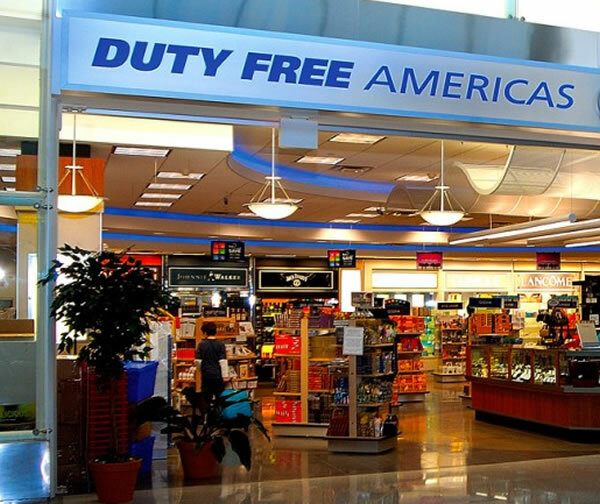 On June 2, 2015, Duty Free America (DFA) has opened a 400 square meters duty free shop at the Toussaint Louverture International Airport. A week before the inauguration, they invited the Haitian Tourism Minister, Stephanie Villedrouin Balmir to personally check out this as one of the beautiful stores in Haiti. To build this store, DFA has rebuilt half of the airport so that the tourists and the local consumers can get a new experience. It is a shop that caters everybody equally. The new store is more focused on liquor, sunglasses, watches, fragrance and other accessories plus edibles. 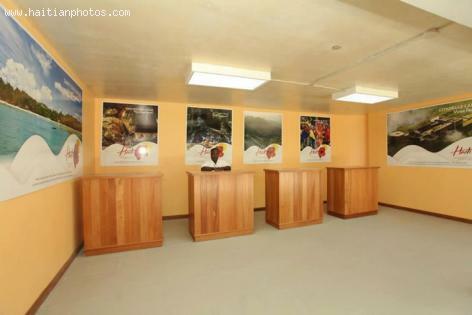 Duty Free Americas (DFA) opened its first duty free store in Haiti on December 18, 2012, at the Toussaint Louverture International Airport arrival lounge near the capital city Port-au-Prince. It was followed by another at the departure lounge in the next year. Here is a picture of Haiti International Airport during the government of Dumarsais estime. 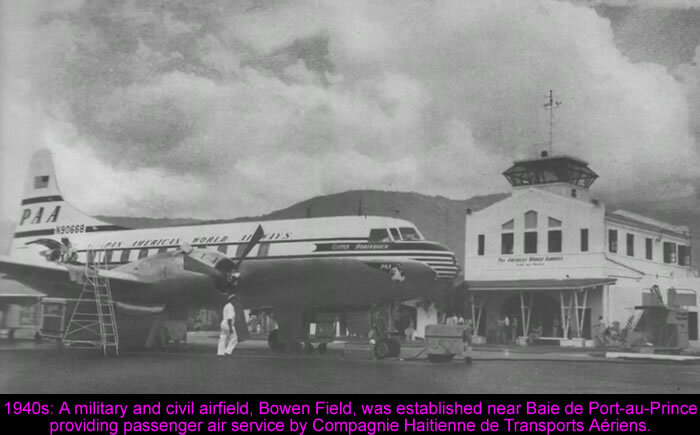 The History Of Toussaint Louverture International Airport. Toussaint L'Ouverture is the busiest Haitian international airport located in Tabarre, near Port-au-Prince. In the beginning, during the 1940s, it had been both a military and civil airport. Later, during 1950s and 1960s, it served as a U.S. military base in Haiti. In 1965, with the grant money collected from the "People of Haiti" (lottery, taxes, etc.,) and the U.S. government, the airport was developed in the name of then President François Duvalier. In 1986, it was renamed as Port-au-Prince International Airport. The name was changed again in 2003 by President Jean Bertrand Aristide in the honor of the Haitian revolutionary leader of Toussaint Louverture. The airport was severely damaged in the 2010 earthquake. 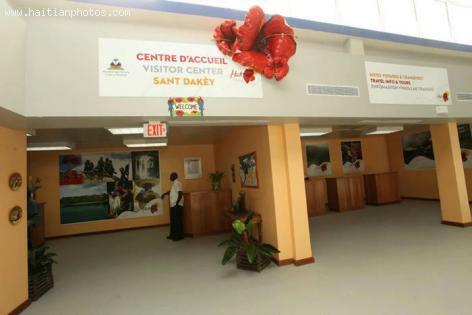 President Martelly has opened the newly repaired arrival terminal on 25 November 2012. The main building serves as the International terminal. It houses two-story concrete and glass structure, few retail stores. Immigration and check-in facilities are located on the ground floor. The "Guy Malary Terminal" is used for domestic flights. There are specified areas for general aviation and cargo flight. The airport has three jet bridges, mobile stairs, and the ramp can handle 12 planes. There is a renewal program that to be completed by 2015. Toussaint Louverture International Airport serves as operating hub for scheduled domestic airlines SALSA d'Haiti and Tortug' Air, as well as the charter airline Sunrise Airways is based out of the Port-au-Prince airport. 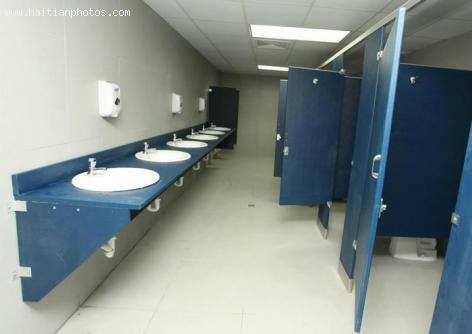 Here is a picture of the new Public Bathroom at Toussaint Louverture airport. This was quite an accomplishment. This airport was damaged by the 2010 eartquake. It can be accessed by car or by National Bus Route 1. 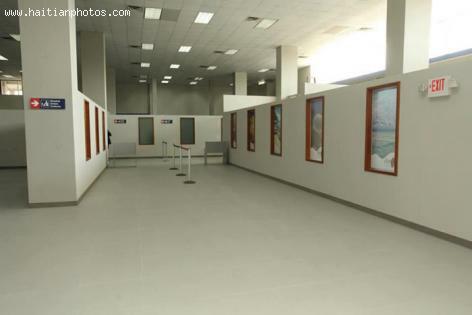 This is a look at the new Public area at Toussaint Louverture airport. It is about time that we have pride and feel that we can actually receive other people at our airport. New Design at Toussaint Louverture airport. it is equipped with Lounges and a few retail stores that are located on the second floor of the main building. 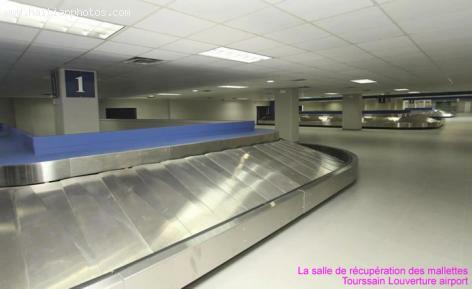 Here is the new Baggage claim area of Toussaint Louverture airport. This is considered to be a major improvement. The improvement work at Toussaint Louverture Airport was supposed to be taking place at the main building of the airport to transform it to an international Terminal. It consists of a two story concrete and glass structure. 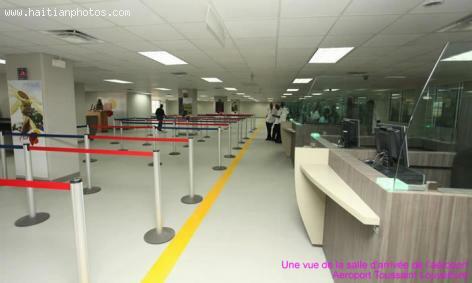 You are looking at the new waiting lines at Toussaint Louverture airport. This has been a major improvement. This airport served as an airbase for the U.S. military in Haiti in the 1950s and 1960s.